David has been competing for the last 10 years. He has 5 Championships on the 2 dogs. 2 PDCH for Shadowfax and 3 ADCH for Strider. Shadowfax is the only Eskie that has Achieved the Bronze PDCH. At least she was at the time that she did it. She’s also achieved her Lifetime Achievement in USDAA as well. Strider has done her one better by achieving his Silver Lifetime Achievement in USDAA as well. Strider also has IAT in UKI. Both have Masters Titles in AKC. Both have competed at NADAC Champs twice and USDAA Cynosports twice. 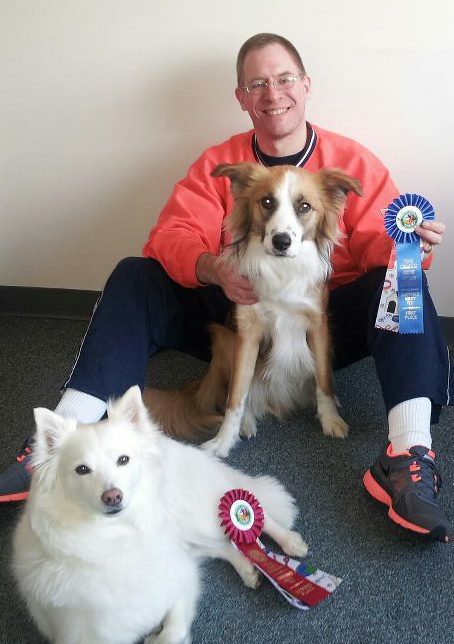 Dave also runs his Papillion from time to time and he’s earned Masters Titles in USDAA in Jumpers and Snooker.